After our somewhat gruesome diversion into throat slashing, highway robbery and the Tyburn tree for Halloween yesterday, we are back in more staid company today with a Livonian gentleman of letters, Garlieb Merkel. Merkel was born the son of a rural priest and though he did not share the privileged early life of some of our salon guests, he was a studious child, possessed of a fierce intelligence. Encouraged by his family he toiled hard at his studies and by the age of 17 was in regular employment as a private tutor to upper-class children. His work naturally took him to Riga where the young man found himself surrounded by intellectuals, excited by the opportunities and ideas he found in the in the capital. Throwing himself into this new world, Merkel became part of influential intellectual circles, who were impressed by his eloquence and passion. When Merkel was 27 he published Die Letten (Die Letten vorzüglich in Liefland am Ende des philosophischen Jahrhunderts, Ein Beytrag zur Völker- und Menschenkunde), a searing indictment of the challenges and abuses the peasantry faced at the hands of their Baltic German landlords and landowners. The book made a plea to the Imperial Russian government to address these injustices and set right the many cruel wrongs that the poor were experiencing. Merkel's work found a concerned audience and was republished in several languages. Perhaps inevitably, the backlash from the landowners was swift and furious and Merkel fled Livonia for Europe, eventually taking up residence in Berlin. He remained in Germany and worked as a writer, journalist and editor for a decade before returning to his homeland. Here he continued to write, publishing several volumes of memoirs and political works; although Merkel would live to a ripe old age, Die Letten was not actually translated into Latvian until the end of the 20th century, long after those furious landowners had shuffled off to pastures new. Congratulations on including Merkel in your posts -- he deserves your recognition. His story has suffered a bit, though, in your telling. Notably, he had to go abroad, to Leipzig, to publish Die Letten -- in 1797 it could not have appeared in the Russian Empire, and was promptly banned by the Russian authorities. The extent of its popularity needs checking, as does the number of translations. 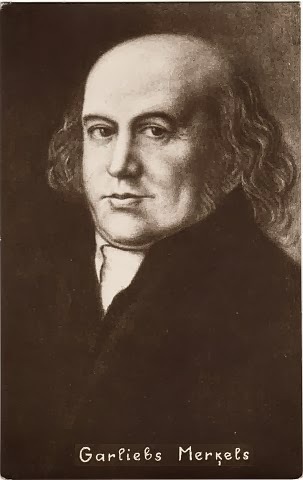 Merkel studied at Frankfurt-an-der-Oder, visited Weimar only briefly, tried a job in Denmark, before settling in Berlin until 1807, where he published controversial literary criticism and an increasingly anti-French periodical. The French invasion drove him out and forced him to flee back to Riga. When it was safe, in 1816, he tried to re-establish himself in Germany, but failed. In Riga he became a publicist and notable periodical publisher. When the Latvian and Estonian peasants were emancipated (1817-19), Tsar Alexander I gave him a pension. Die Letten was translated into Russian in 1870, and into Latvian after 1905. The new Latvian nationalist movement (Young Latvians) in the 19th century found great inspiration in Merkel's works, and put up a monument at his grave outside Riga in 1869. Thanks again for including him. Thank you for your comment. I have an academic chum who fact-checked elements of this post for me and I shall speak to him forthwith - let's hope he's not due a stop at the pillory!